Though you might not expect it, New Jersey offers Southern-inspired barbecue both out of popular food trucks and trendy sit-down restaurants. At these top spots, hungry diners will find tender beef brisket, juicy pulled pork, slow smoked ribs, and all the traditional sides to complete your meal. For other unique flavors taking you outside of America’s South, we’ve also included Korean and Portuguese barbecue for more flavorful options! Here are our favorite BBQ joints in the state. More Than Q serves up smoky, tender meats including brisket, sausage, ribs, and burnt ends accompanied with traditional Southern sides. The menu is designed with Texas-style barbecue in mind, so you’ll find brisket, pulled pork, pulled chicken, and other meats by the pound, or as a slider or sandwich. Savory sides, such as cheddar cheese grits, collard greens, and kale and Brussels salad, create the perfect meal. Opened by a former U.S. Marine, Red White & Que pays tribute to America’s Southern-style barbecue. 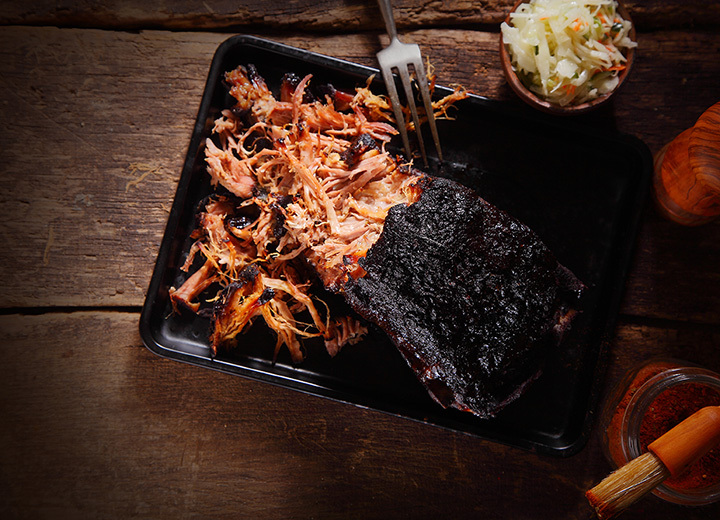 The menu offers barbecue lovers brisket, pulled pork, and ribs served by weight. All homemade sides are finger-licking good and some options to write home about are their jalapeno cheese cornbread, fried pickles, and coleslaw. They also serve Buffalo wings by the pound, and you can opt to finish off your meal with a traditional banana pudding. The Hambone Opera consistently leaves diners pleased with their meal and ready to return for their next. The meat served by Hambone Opera is smoked for 12-13 hours to infuse the meat with the flavor of the smoke as well as make it incredibly tender. On the menu, you’ll find pulled pork and brisket sandwiches and platters, meat by the pound, and a handful of sides. You can find Hambone Opera serving Southern barbecue at the Trenton Farmers’ Market. Available for both catering and as an eat-in restaurant, Henri’s “Hotts” Barbeque can cure your barbecue craving with smoked Texas-style meats and homemade side dishes. The restaurant menu offers diners chicken platters, baby back ribs, pulled pork, and brisket as well as a few seafood options. They also offer wings, sandwiches, and sides such as mac & cheese, collard greens, potato salad, and whipped yams. Do note that Henri’s is closed for the winter. Fink’s offers diners a massive menu packed with appetizers, slow cooked smoked meat, salads, and hearty sides. Opt for the spare ribs or ends, or to try a little bit of everything, how about the pit sampler, which includes spareribs, chopped beef, and pulled pork. They are also known for their delicious sides like their sweet corn soufflé. And don’t forget about Fink’s weekly specials where you can enjoy discounts on wings and baby back ribs. Using the freshest ingredients, Big Harlie’s slow smokes chicken, pork, and beef to create succulent meals bursting with flavor. Big Harlie’s Sampler Platter is one to order as it comes with rib tips, burnt ends, and hot or traditional wings, which provides the best of their menu on one rather large plate. To accompany your meal, you’ll find dirty rice with sausage, baked beans, candied yams, and other delicious sides on the menu. Christine’s House of Kingfish is a food truck that serves slow smoked ribs, grilled chicken, and grilled fish. Opt for their rib and fish platter if you can’t decide between one or the other, and get two sides to make it a very filling meal. Side options are delicious and include string beans, sweet potatoes, and corn bread among others. Sugarpuddin’s brings Missouri-style barbecue to New Jersey with an ample menu of barbecued meats, sandwiches, and combo platters. Try the Charleston Special, which consists of a slab of juicy ribs and chicken. Or have some fried catfish with corn on the cob to bring you all the way South. But do be sure to save room for dessert as Sugarpuddin’s is known for serving Southern-style desserts that vary from day to day. Carlee’s BBQ grills meats on traditional Portuguese racks over hot coals. They serve ribs, sausages, chicken, and ribs. For seafood lovers, they also serve grilled salmon that can be purchased half or whole. The flavors from the special Portuguese roasting style provide a contrast from the typical Southern-inspired barbecue found in New Jersey. Travel to Asia via the barbecue experience at Dasiwa. In addition to ample sushi and noodle offerings, Dasiwa has five different Korean barbecue options. Enjoy prime beef rib eye bulgogi and seasoned prime beef ribs. This is a great barbecue options to not only sample different flavors, but to please a party with vegetarians as they have ample vegetarian and vegan-friendly dishes.